Fault Tolerance (FT) was first introduced with vSphere 4.0. It is a feature that protects virtual machines against host failures by creating a secondary VM that resides on a different host in the cluster. When the primary VM fails, the secondary seamless takes the place of the first one, with the least possible interruption of service. In previous versions Fault Tolerance relied on a technology called “Record-Replay” to keep the primary and secondary VM in sync. 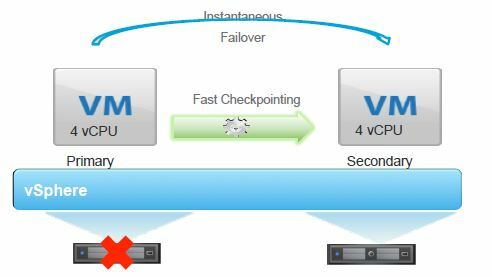 With vSphere 6, Fault Tolerance uses a new and more scalable technology: Fast Check-Pointing. By the way, this new technology was the key to support up to 4 vCPUs! Another important improvement is the support for vStorage APIs for Data Protection (VADP). With this API it is possible to backup Fault Tolerance VMs using non-disruptive snapshots. On the storage side a lot has happend, too. Previous FT versions used the same storage for the primary and the secondary VM. Now it is possible to place these two VMs on different datastores to protect both VMs against host and storage failures. As FT is very resource intensive, VMware recommends a dedicated 10 Gb network connection for FT VMs. During a Q&A in the Beta Program VMware was asked if FT can be used to protect the vCenter Server. This is a very interesting question since vCenter Heartbeat is no longer available (end of life since June 2014). The answer was, that VMware is currently testing it – hopefully we will get more information about this soon. SMP-FT will be supported for vCenter Server for some use cases. The exact details are still being finalized and we’ll let you know what that looks like closer to the downloads becoming available. Thx for the clear comparison between vSphere 5.5 and 6.0, well done!